If there is one person who had all the reasons to have pride - it would be King Solomon! Why? Because the Bible says there was no one before him or no one after him who would be as wise as him! But, King Solomon himself stays away from pride as carefully as possible. We can repeatedly see many references in Proverbs where he shuns away from pride and warns us to the consequences pride can lead us into. I am sure he had found it out to be true that being humble at heart would help receive the grace of the Lord. Pride is a trap. Once we fall for it, it is very difficult to come out. These verses are here to warn us. Let us avoid pride at any cost! We tend to relate blessing to the matters of this world forgetting that this life we live right now is only temporary - a make-shift phase in God's eternal plan. If someone has huge wealth, great fame and good fortune we call them blessed. But are they? The Scripture here tells us if our transgressions are forgiven and our sins covered and there is no deceit in our spirit, then we are blessed! And in whose spirit there is no guile - Who are sincere and true. That is, who are not hypocrites; who are conscious of no desire to cover up or to conceal their offences; who make a frank and full confession to God, imploring pardon. The "guile" here refers to the matter under consideration. The idea is not who are "innocent," or "without guilt," but who are sincere, frank, and honest in making "confession" of their sins; who keep nothing back when they go before God. We cannot go before him and plead our innocence, but we may go before him with the feeling of conscious sincerity and honesty in making confession of our guilt. Let us go before the Lord baring everything from the inner most parts of our heart - not trying to hide anything. Let us ask for sincere forgiveness and receive the assurance our sins are covered; that is what makes us blessed! As much as we don't want to admit, there is a complaint against us this morning - that we don't love the Lord enough - not as much as we used to. When love becomes cold in any relationship, it doesn't take too long for total disaster of 'growing apart'. Growing apart from God's love would be a tragedy in the real sense. As you can see, loving the Lord involves a total re hauling of our inner being, a complete makeover if you will - getting rid of the unwanted, bringing in the must-have's, washing, cleaning, scrubbing, loving the good, hating the evil, purifying our hearts, obeying the truth, humbling ourselves, accepting the word, the list goes on... as we read more of the Scriptures. Let us make it our priority to love the Lord - as much as it is expected of us. Let us get back to our former love - the way we first loved Him! It was not my intention to share these Scriptures today; I truly believe it is from the Holy Spirit for those who need to hear. The church in Pergamum had many good things about them - they remained true to His name, they did not renounce the faith in Christ. Yet, they went wrong in who they were associating with - there were people who believed in idols and those who followed false teaching, among them. So, whom are we associating with today? Do we stand firm in our faith that Jesus is the only Way? Or do we reason saying there may be more than one "ways"? Do we know the absolute Truth from the Scriptures or waver at every new "doctrine" out there? Do we stay clear of idols and sexual immorality that are justified by the false teachers? Are we sensitive to the Word of correction the Holy Spirit reminds us about or ignore it and carry on our lives in sin? We got the message; let us be holy! A stone was brought and placed over the mouth of the den, and the king sealed it with his own signet ring and with the rings of his nobles, so that Daniel’s situation might not be changed. Then the king returned to his palace and spent the night without eating and without any entertainment being brought to him. And he could not sleep. We too serve the same Lord, don't we? Daniel's God is our God, is He not? Do you still doubt He can deliver you from the "lion's den" you are currently in? Remember this: He will send His angel to rescue you out! Amen! Let us continue to serve Him and Him alone. Be blessed. Enjoy the weekend. How is it between you and the Lord? Sara Grove's song "How is it between us" is one of my favorites. Sure, go ahead click here to turn it on! Every now and then things get too busy in our lives that we take a little too long to catch up with the Lord. Hours, days, weeks could slip by so fast without a moment of pause. When was the last time you had a conversation with the Lord? I am not talking about a quick customary "hi and bye" kind of conversation. I mean a true heart-felt conversation; a one-on-one, where you put down your guard and pretense and come to His presence - just the two of you - you and Him?! How is it between you and the Lord? How is it between you both? How is it? When did you talk to Him last, and what has happened since? Did you thank him for the autumn leaves? Did you tell Him about your youngest child? Did you laugh out with Him about the comment she made? How about the birds you see, the coffee you smell, the clothes you tried, the new perfume you got, does He know what you feel about it all? Did you complain about the long commute it took only to realize it could have been worse? Did you inquire about the new pimple you spot? Did you share your fears about your aging Dad? Did you plead your case to lose some weight?! Does He know you love the clouds? We get the point; don't we? Wisdom is much more precious than precious metals and gems. Let us seek for wisdom like we would seek for treasures. So, how exactly does God speak to us? For some God speaks to them in visions, dreams and even audibly. But for most part, God speaks to us through His Scriptures - the Holy Bible! The Holy Spirit residing in us, will make us conscious to specific Scriptures, as we read it. That's why it is vital to read the Word of God on a regular basis, with an expectation to hear from Him. We would wish He was "louder" at times. But it is against His very nature to force an entry in our lives. He simply knocks. Gently provokes. Quietly talks. If our hearts are sensitive to His call and ears are attentive to His voice , we will open at once, obey immediately & listen patiently. True, sometimes we will hear what we don't want to hear. That's when most of us suffer the "hardening of the heart" syndrome. We twist and turn and make things work out the way we had intended it to, in the first place. We come up with logical reasoning as to why we can't do what the Lord prompts us to do. We find excuses to downplay His voice - the gentle reminder from His Scriptures. Light is defined in the dictionary as "the natural agent that stimulates sight and makes things visible". Let it be our prayer that we become the natural agent that stimulates sight and make things visible for those still in darkness around us. Yet shall we rejoice in the Lord? Ask any believer he/she will share with you the times when his/her prayers did not get answered (the way they expected that is). What happens then to our faith?! Do we continue the Spiritual walk or find it an excuse to stray? Here Habakkuk makes a strong statement which attests to his faith during difficult times. Of course his hope is that the fig trees would bud and there would be plenty of grapes in the vines, the olives would not fail and his fields would produce food; he absolutely wishes for his sheep to multiply. But what happens if his desired outcome is not met? Will he be upset with the Lord? Will he be heartbroken and depressed? No! Absolutely NOT!! In fact he says he would continue to rejoice in the Lord and that he would be joyful. Amen! In other words his joy is not based on external circumstances but comes from within. Irrespective of the outcome of his yield he will rejoice in the Lord! What is our story? What material our JOY is made of - external or internal? Who is he, this King of glory? 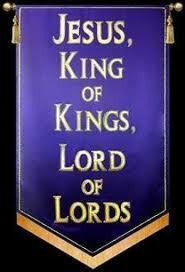 The LORD Almighty--he is the King of glory. As we stand before His throne today in our prayer & worship, how do we visualize our self? What is our expectation? Are we seeking His presence as the King's mere citizens forgetting that we are His own children? Sometimes we get a revelation or promise from the Lord through a dream or vision or a word or song or a message. But it may not immediately come true. If that is your case, the Bible says, "Though it linger, wait for it; it will certainly come and will not delay." Sometimes things may not work out the way we are expecting it, but it definitely does not mean His promises have failed. In course of time it will all come clear for our understanding. For now let us accept the limitations and move forward. One thing to remember is: "All things happen for good for those who love the Lord." Amen! Hang in there; His promises are Yeah and Amen! Forget the former things; do not dwell on the past. For some of us gathered here this morning, things of past is where our heart is at. Like the Israelites we keep referring to our Egypt. Like Lot we keep turning back at our Sodom. This is sure a distraction in our spiritual walk. We can not enjoy the freedom and full benefits of God's leading as long as we cling on to things of past. Alright, childhood was carefree. Younger days were more fun. Old was gold. The Ex (a friend, spouse, a job, a house etc.) was not that bad after all. Life was indeed good, better those days. But we have to move on! We can't appreciate what is in store for us if we are not looking forward to the life ahead. This is the moving day. So, let us move on today; forgetting the former things and not dwelling on the past. God is doing a new thing in us and among us. He is making a way in our wilderness and streams in our wastelands. Let us be expectant of that. Praise the Lord! God bless you all. Have a blessed Friday! Life can get weary sometime. The routine toil day after day could easily overwhelm us. Where will we go then? What will we do? How will we find solace? Only by taking it all to God Almighty giving heed to His invitation: "Come to me, all you who are weary and burdened, I will give you rest". Interestingly the invitation is forever open, it is us finding time to attend to it that prevents us from enjoying it's benefits. In Matthew 6:33 we read: "Seek ye first his kingdom and his righteousness, and all these things will be given to you as well." Often times our burden gets heavier because we have not sought after God first. Let us set aside a regular prayer time and list all our needs at His feet and see if His invitation stands true in our case. I am 100% positive it is! Tested & true! Would you like to try it yourself? "Rejoice!" is an often mentioned command throughout the Scriptures. Yet, that is one area we Christians fail from time to time. All it takes is one criticism or one sickness or one crisis, or you name it, to offset us from our joy of salvation. One may wonder how we can rejoice irrespective of the circumstances. Or is it even possible to rejoice always? 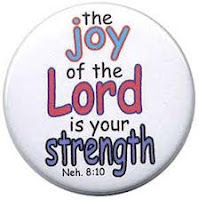 Yes, when God anoints us with the oil of joy we can rejoice in all situations! What does it take to be anointed with oil of joy? According to today's Scripture, when we love righteousness and hate wickedness God will anoint us with the oil of joy. Let this be our prayer too today: "Restore to me the joy of your salvation and grant me a willing spirit, to sustain me." The message for today is: Hold on to what you have! To sum it all up in one sentence, let us hold on to the good, our hope, eternal life, wisdom, our faith, the Scriptures and the promises given us. Hold on tight! Don't loosen the grip! Does the LORD delight in sacrifices? It is true that the Lord had given specific instructions about burnt offerings and sacrifices in the Old Testament. In course of time it became an easy way out for many with rebellion and disobedience. King Saul was reprimanded by Prophet Samuel for his disobedience. Saul could have thought he could quickly undo his act by making some amendments in terms of offerings. King David on the other hand seems to have a clear handle on what is expected by the Lord. He says in Psalm 51:16-17: You do not delight in sacrifice, or I would bring it; you do not take pleasure in burnt offerings. The sacrifices of God are a broken spirit; a broken and contrite heart, O God, you will not despise. In Proverbs 21:3 we read: To do what is right and just is more acceptable to the LORD than sacrifice. In Jeremiah 7:22-23 God clarifies His commands about sacrifices: He says, "When I brought your forefathers out of Egypt and spoke to them, I did not just give them commands about burnt offerings and sacrifices, but I gave them this command: Obey me, and I will be your God and you will be my people. Walk in all the ways I command you, that it may go well with you." It is evident from these Scriptures that no sacrifices will please God than our humble spirit, broken heart and obedience. Is that hard? Praise God for this wonderful Scripture this morning! Fear, shame, humiliation and disgrace are sure dreadful. All of us can recall incidents when we have suffered such situations. For some it leaves a permanent scar, making them fearful of further shame or disgrace. This is surely one of satan's cunning tricks as he knows that with as little as casting a shadow of doubt he can lure some of us to death, away from the life we have found in Christ. He doesn't have to work hard at it if we are unaware of what the Word of God promises us. Knowing the Scriptures will enable us to stand firm and rebuke him in the Name of Jesus! So, it is important we read the Scriptures and by heart a few for our every day use. It will help us eradicate every single doubt that ever so lightly crosses our minds. I will not fear, for I will not be put to shame; I will not feel humiliated, for I will not be disgraced; But I will forget the shame of my youth, And the reproach of my widowhood I will remember no more. My Lord has said so! Go ahead! Claim it as your own! It is the Holy Spirit who is sharing! Amen! We get the message - Fear the Lord and serve Him with all your heart! Don't we? It is no accident you are here this morning hearing what the Holy Spirit has to share with us - loud and clear. Just as how unnatural it is for a girl/lady to forget her jewels/fine clothes it is unnatural for us to forget God and cherish not the fond memories of our past affection. Yet some of us have gone astray. We have forsaken our first love. Hope this is not entirely true in our case. But if we are not conciousely making every effort to stay in love, we will be easily carried away by worldly affairs making us remember the Lord less and less. If we are not watchful very soon we will be far from the Lord heading into darkness. Definitely it is not something that will go unnoticed by God. He would sense the slightest withdrawal from us. We will be crucifying Him all over again when we do that. What is it that we lack in Him that we forget Him from time to time? That we do not make time for Him? That we go days on end without hearing from Him or talking to Him? We are often worried and troubled by the news of sickness among our friends, family, church members, colleagues, community etc. Our hearts melt in fear when we have to wait for certain test results at the doctor's office. But these are unnecessary worries. If we worry the same way as non-believers what difference does our faith make in us? Instead of worrying over things beyond our control let us praise God for what we have - the joy of salvation, the hope of eternal life, that we still have breath in us, that we are able to move around and for everything that works fine in us that we often take for granted. Even when we are diagnosed with some sickness, however life threatening it is, it does not help to worry. I am sorry if that sounds insensitive. But that is what the Scripture tells us. Jesus said in Luke 12:25,26: "Who of you by worrying can add a single hour to his life? Since you cannot do this very little thing, why do you worry about the rest?" Only as long as we have the breath in our nostrils we can praise the Lord; so like King David let us make the most of our life praising the Lord: In Psalm 115:17,18 he says,"The dead do not praise the LORD, Nor do any who go down into silence; But as for us, we will bless the LORD From this time forth and forever. Praise the LORD! He is our Healer! Whether He heals us for life or decides to take us home, no denying that He is our Healer. He paid the price for our sickness too on the cross along with our sins. Let us rebuke all fear, doubt, worry and sickness away from our dear ones and get protection under His wings. Let us not take things for granted but remember to praise Him for the countless blessings in our lives. So why worry? Only praise! Wonderful Counselor - What does that mean? Counselor is one who counsels; or advises; or instructs. Having God as our Counselor would imply depending on His guidance or advice. In fact Holy Spirit is our constant Counselor. Just as Jesus was getting ready for His ascension He had promised to send us the Counselor - Holy Spirit - the Spirit of truth, who would live with us and be in us! Even as we pray for our children let us pray over these blessings on them that they are led by the Lord so that their peace shall be great. Isaiah 54:13 And all thy children shall be taught of the LORD; and great shall be the peace of thy children. Lack of peace can surely be linked to not following the counsel of the Holy Spirit. If that is our case today let us recommit our lives to heed to the instructions of our Wonderful Counselor. Shall we? Jesus! Say it with me, Jesus! You will agree it is the most popular name ever, of all ages and times. It is the name above all names! Jesus! For those who still think Jesus was just human, here's something to think about. Only for about 3 1/2 years Jesus was publicly preaching, doing miracles and the like. There was no TV or Internet to broadcast His messages across the universe at that time. How do you suppose His name has stood the test over thousands of years?! Can you change a life by telling someone about any other person who have lived on this earth - past & present? good and bad? How is it that the name Jesus is still changing lives? Still working wonders? Philippians 2:5-11 has the answer. It says, Christ Jesus: Who, being in very nature God, did not consider equality with God something to be grasped, but made himself nothing, taking the very nature of a servant, being made in human likeness. And being found in appearance as a man, he humbled himself and became obedient to death— even death on a cross! Therefore God exalted him to the highest place and gave him the name that is above every name, that at the name of Jesus every knee should bow, in heaven and on earth and under the earth, and every tongue confess that Jesus Christ is Lord, to the glory of God the Father. Amen! Jesus is the name above every name. We are so privileged to have such a personal relationship with Him. Not only that. He knows us by our name and loves us the best. Isn't that something?! El-Olam - God Eternal! Eternal or everlasting means forever and ever! There are numerous Scriptures about the everlasting nature of God. Here in Isaiah we further understand how this Everlasting God - El-Olam helps us renew our strength like eagles. Indeed our Lord and Savior Jesus Christ is El-Olam! All glory, honor and power be unto Him forever and ever. Amen! El-Roi! "I have seen Him! ", was Hagar's excited statement when she encountered God as she was running away from Sarai while with child Ishmael for Abram. How many of us would love to encounter our Lord face to face like Hagar did?! I know I would! It has been my sincere prayer every night that I should see my Lord in a dream/vision - even a glimpse as I once had when I was a child. King David was hopeful of seeing the goodness of the Lord in his life time; he has written in Psalm 27:13, "I would have despaired unless I had believed that I would see the goodness of the LORD in the land of the living." We know for a fact he did see the goodness of the Lord just as he had hoped. Some of us like King David want to see Him now; the rest of us would be okay to wait till our life after. But the fact is, whether we are looking forward to seeing Him or not, every one (from past/ present/future - which includes you and me) is going to see Him face to face one day! The Scripture says in Revelation 1:7, "Look, he is coming with the clouds, and every eye will see him, even those who pierced him; and all the peoples of the earth will mourn because of him. So shall it be! Amen." The question today is: Are you ready to meet El-Roi - the God who sees? God Most High implies there is nothing/nobody in past/present/future who is higher than Him. There is no superior to Him. He is it! We have reached the highest in the authority chain - to whom we can compliment, complain, request, hang out with, make petitions to, stay in touch with, take pride to connect with, regarding the situations we are in. The one and only God Most High our El-Elyon! This is what the Lord says: “Heaven is my throne, and the earth is my footstool. Where is the house you will build for me? Where will my resting place be? Has not my hand made all these things, and so they came into being?” declares the Lord. * Do we hold Him in high esteem ourselves? * Is He the God Most High - El-Elyon in our lives? * Do we have the humble and contrite spirit that trembles at His words, that He desires in us? El-Shaddai - God Almighty! An often used phrase in our prayers and worship and sermon etc. But have we given much thought to it's meaning? El-Shaddai according to some Bible translators stands for 'God Almighty' but not all agree. No doubt El means God; it is the Shaddai that causes controversies among Bible translators. Some say it means 'mountain' and some claim it means 'destroyer'. Putting these arguments aside, let us consider the almost universal meaning - God Almighty. Dictionary defines the word 'Almighty' as "having complete power or control"; with synonyms such as: absolute, all-powerful, invincible, mighty, omnipotent, supreme, unlimited, etc. So when we pray to our El Shaddai - our God Almighty - we are in fact standing in the presence of Omnipotent, Supreme, All-Powerful, God. He is the very same God who created the whole earth and all that is in it by His mere words. Knowing our Lord as God Almighty will give us a new perspective when we pray. There is nothing He cannot do. There is nothing impossible for Him. He is Almighty! Our El-Shaddai! Amen! Finding someone's name is one of the very first things we do when we meet someone new. It is our first step to getting to know that person up close. As we get closer we get to know their nick names, other names, family names, childhood names and so on. Surely this helps with bonding and we get to know more of that person. Same way, knowing Jesus Christ as Lord is great! But learning about various other names will help us know Him better. It will teach us many things we haven't known of Him already. Today's Scripture has made is clear, there is no other name ever given to anybody in the past, present or the future that would be elevated as high as the name of Jesus Christ! Jesus Christ is the name above all names! In heaven, on earth and under the earth every tongue will confess Jesus Christ is Lord - even those who haven't quite confessed it yet! How about we learn more about Jesus Christ - our Savior - by learning more about His other names?! I am sure during this process we will come to know a lot more about Him we might have missed otherwise. So, stay tuned as we start our new series: Name above all else. Share the link with your friends/family and invite them all to the coffee table; the more the merrier! Freely you have received; freely give. Generosity is a virtue every believer must exhibit; however it is sadly on the decline. The economic downfall in the recent years has only made it convenient to justify our withdrawal. As today's Scriptures remind us, we need to develop a generous heart. We can do that only when we fully understand His generous grace on us. When we believe that the Lord is our everlasting Source and not our jobs or savings or name or fame or anything else we are a step closer to realizing generosity in us. Trusting that He holds our future and desiring to be a blessing to others will land us on opportunities that will enable us to reach out. Not just money; our time, our talents, our abilities, our fortune can all be used to glorify the Lord. After all we are homeward bound; let us act like one! Several people from the Scriptures such as Nehemiah, Jeremiah, King David, Job, one of the thieves on the cross, had one prayer in common: "Remember me".Some of their agony is clear from their crying out: "Will you forget me forever?" or "Why do you hide your face from me?" Taking a closer look at the list we can understand that they were among prophets, kings, nobles and also criminals, which means that the feeling of abandonment occurs to people from all walks of life, including you and me! How do we tackle this feeling; now that is the question. King David sings, "My soul is downcast within me; therefore I will remember you " Psalm 42:6 which has the answer for us. So, whenever we feel downcast, rejected or abandoned, let us remember our Lord! We don't need much proof that our days run faster than ever. We see signs of it everywhere. The mirror gives it away every time we see our reflection in it. Didn't we just begin the year? Already we are in October and before we know it, it will be year end. Even this past week went by in a blink. The days and weeks and months and years seem to roll one into another seamlessly. Job and King David felt the same way from time to time. We see them mentioning it repeatedly in Scriptures. It is interesting how they both focus their attention back to the Lord amidst their panic. Let us too do the same. As we become more cautious of our fleeting days let us become more appreciative of the Lord's providence and more aware of His favor on us. God bless you! Have a blessed month ahead!